If you are new to commercial real estate, knowing who to contact for your needs can be confusing. Between asset services, project management, investment services and tenant representation, most companies have several separate departments that specialize in a specific aspect of the real estate process. 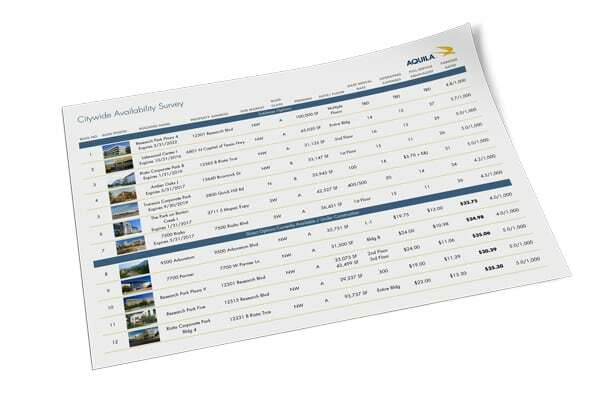 At AQUILA, we like to supply our clients with plenty of information to help them feel confident from day one. To help you better understand what a tenant representation broker is and what they do, we decided to give a brief overview of that exact topic. What does a tenant representation broker do? How will a tenant representation broker help me lease space? How will my tenant representation broker help me during the course of my lease? What other services do tenant representation brokers offer? Tenant representation brokers are basically what they sound like; they handle the tenant side of commercial real estate transactions. Sometimes referred to as tenant advisory or corporate services, a tenant rep is there to assist companies and organizations throughout the entire leasing process, from the initial needs assessment and site selection to occupancy, lease expiration, and beyond. While there are many benefits to hiring a tenant representation broker, one of the biggest is that they take the stress of the real estate process off your plate. Finding the right real estate solution truly is a full-time job, and a tenant rep will run the process for you, presenting you with the best options to fit your company, while you focus on what matters most to you. One of the primary jobs a tenant rep performs for their clients is helping decide whether the tenant should renew a lease for their current space, or begin searching for a space to relocate to once their lease is over. We discuss renewals later in this article, but the basic premise is that tenant reps will generally recommend a renewal if the tenant is happy with their space and could not achieve significant savings by relocating elsewhere. However, if the tenant does want to relocate, the tenant rep will assist throughout that process as well. During the needs assessment phase,the broker meets with the client to discuss their current real estate needs, future growth plans, and more. An experienced tenant rep can help the tenant narrow down their wish list and define a specific space requirement that will best suit their needs, including location and size, as well as other factors like type and quality of office space, potential for growth, term, etc. Each submarket in Austin has its own defining characteristics, including average asking rates and typical office types. These defining qualities must be weighed against a tenant’s priorities and goals to find the right area for what the tenant wants. A tenant rep broker will listen to the tenant’s needs and can recommend the submarket best suited to what the tenant requires. For example, office space downtown is typically considered the most desirable in Austin, but it is also the most expensive, has parking challenges, and would likely not be ideal for companies with limited budgets. In contrast, office space in the Northwest is typically more affordable, but would not be ideal for a company whose employees and leadership all reside in the Southwest. Obviously, location of employee residences is an important factor in choosing a submarket. Good tenant rep firms can produce employee “center of gravity” maps that assist in identifying office locations that are most convenient for their workers. If you would like to learn more about the pros and cons of Austin’s three main submarkets, see our blog post, How Much Does it Cost to Lease Office Space in Austin, Texas? Estimating what size of office to lease is often the hardest thing for a tenant to do, but tenant rep brokers specialize in doing just that. By considering how many employees there are, the desired office layout (private office vs. open floor plate), how quickly the company plans to grow, etc., a tenant rep can estimate how many square feet the tenant will likely need. Whether you are a startup with high growth potential or a large, an established company looking for a new headquarters, finding the right amount of space for your needs is an important step in the leasing process. If you would like to get a quick estimate of how much space you are likely to require, feel free to use our Austin Office Space Calculator. An experienced tenant rep will take this opportunity to have a brief conversation with the listing broker to makes sure the terms they are willing to offer generally fit within the tenant’s criteria. For example, if the tenant requires a short-term lease but the landlord is unwilling to do anything less than seven years, that property will likely be eliminated from the survey. Tenant reps attempt to identify these and other potential “deal killers” early to make the tour and negotiation process as efficient as possible for everyone involved. The Market Survey will be one of the tenant representation brokers first steps towards finding you the right real estate solution. After discussing with the client and narrowing down the list to about five to ten spaces, the process of touring can begin. The tenant rep will contact the brokers that represent each of the buildings identified to set up a date and time to come see the space. This market tour generally happens in a single day, and if coordinated properly, lasts about 30 minutes per property (including drive time between each building). Quality and layout of the suite. Each tenant has their own opinion as to what’s important in a new space and visiting in person is the best way to make an informed decision on such an important investment. Once the tenant rep has helped the tenant narrow down which space or spaces they would like to lease, the second part of the tenant rep’s job begins. Using a mix of market knowledge, industry connections, and experience, the tenant rep will work to ensure that their client receives the best terms possible for their lease. By now, most tenant rep brokers will have had at least a brief conversation with the landlord’s broker about basic terms the tenant would like to see in a proposal. The tenant rep then sends a formal request for proposal requesting information on the terms the landlord is willing to offer. The letter does not bind the tenant to anything but gives the tenant rep and their client a starting point for negotiations. In this letter, the landlord will outline the rental rate, concessions, and a variety of other details related to the available space that they are willing to offer. Rarely does the landlord send their best offer in this initial correspondence, and it’s the tenant reps responsibility to negotiate on the client’s behalf the most favorable terms possible. The letter of intent (LOI) is the tenant’s response to the landlord’s offer. In this document, the tenant makes a counteroffer with the terms they are willing to sign a lease for, including rental rates, parking, and tenant improvement allowances. The tenant rep will counsel their client as to what is common in the market and which favorable terms they should ask for. Like a request for proposal, an LOI is non-binding. The landlord will likely not agree to all the terms of the initial LOI, however, which leads to the back-and-forth commonly associated with real estate deals. If the initial LOI is not accepted by the landlord, the tenant rep and their client will need to reevaluate their terms to see if any compromises can be made. They will be in constant contact to review deal points, compare offers, and adjust requests based on current market conditions. The tenant rep broker is vital during this time and will help guide their client through the process. The tenant rep’s knowledge of the market and past experiences can make the difference between an average lease and one that is very favorable to the tenant. Since real estate is a rapidly changing industry, tenant reps must constantly stay up-to-date on the market if they want to get their client’s the best terms possible. Most of this research consists of the tenant rep learning about the latest comparable leases and sales, which developments are nearing completion and which are just beginning, and any major zoning or tax changes that could affect the Austin market. To effectively represent a tenant’s best interests, a tenant rep must be confident in their market knowledge and use it effectively as leverage in discussions with the landlord. Market intelligence is used from the initial Request for Proposal all the way to the signing of a lease, so it is important to find a tenant rep with the experience and resources to gather the most relevant information. While individual deal transaction information is rarely made public, some of the market level knowledge eventually makes its way to the public in the form of market reports, which several of the top commercial real estate companies in Austin release on a quarterly basis. If you would like to see where the Austin office market is currently and what our brokers are saying, feel free to read our most recent quarterly market report. Once both parties agree on the LOI and the landlord has drafted a lease, the tenant rep performs a comprehensive review of the commercial terms to verify their accurate compliance with the final letter of intent. While a broker is not allowed to give legal advice, they will work with the tenant’s legal counsel to negotiate legal terms and offer advice to make the lease as favorable to the tenant as possible. This helps reduce review time and make the tenant confident before signing the lease. After the tenant has signed their lease, they will likely be planning some form of renovations to their new space. That means having to manage contractors, designers, and any number of other construction-related professionals. Rather than trying to handle everything themselves, most tenants choose to draw on the experience of their tenant rep. The tenant rep’s goal is to make sure a sufficient tenant improvement (TI) allowance is defined BEFORE the lease is signed. From there, a tenant rep will work with the tenant and project manager to make sure the project stays on time and under budget. While tenant rep brokers do not handle every detail of space build-outs once the lease is signed, most tenant reps will likely be able to refer you to a project manager that can assist you with the process. If you would like to learn more about project managers, including what it costs to hire one, see our article Cost to Hire a Project Manager for an Office Build-Out or Renovation. The job of a tenant rep broker does not stop when a lease is signed. The broker/client relationship will often continue throughout the term of the lease, whether by something as simple as supplying the tenant with market information, to something as complicated as helping the tenant deal with a challenging landlord. Whatever the tenant’s needs, a good tenant rep broker will do their best to continually offer assistance when needed. If the tenant decides to renew or expand, the landlord will likely want to renegotiate the lease and try to get the tenant to pay more rent. In this scenario, a tenant rep broker will play a similar role to what they played when the lease was originally negotiated. The tenant rep will inform the tenant of current market conditions to help make sure they get the best terms possible. Sometimes a tenant’s space needs can change mid-lease, in which case they may need to negotiate an expansion or downsizing with the landlord. In this situation, a tenant rep broker will step in and assist with finding the best option for the tenant. The conversation typically begins with another needs analysis to determine which of these options is the best solution. If the tenant wishes to leave the space and search for another property, the tenant rep will put the site selection process into motion once again. A company who wishes to leave their space before the lease comes to an end, whether this be to expand, downsize, relocate, close the office, etc. Regardless of the reason, subleasing, or the process of transferring an active lease to another tenant, can be a very complicated process, one which most tenants would rather not go through on their own. An experienced tenant rep will know not only whether the tenant can sublease (some leases do not allow it), but can market the space for sublease and find a suitable tenant. Most of the time landlords and tenants get along very well. However, an occasion may arise when a tenant begins having problems with their landlord that they would prefer not to handle alone. In this situation, the tenant rep broker will step in and try to work out a solution between the two parties. The tenant rep’s priority is protecting the interests of their client, so they will do their best to make sure the tenant is being treated fairly and is receiving the terms in their lease. What if You Don’t Want to Lease? Although a tenant representation broker’s primary job is assisting with leases, they also occasionally become involved with sales or purchases of property. If you are attempting to buy or sell a property, or even trying to decide between leasing and buying, a tenant rep can be a great resource. Whether you are searching for an investment property or have decided that purchasing makes more sense than leasing, a tenant rep will be able to walk you through the process. Just as a tenant rep knows about market rental rates and which space are available to lease, they will also likely know of comparable sales in the market and which properties may be available for purchase. This type of information can be difficult to find, especially in Texas, where sale prices do not have to be disclosed, so having an experienced tenant rep handling the research can save you a significant amount of time. Just as a tenant representation broker can assist you with the purchase of a property, should you want to sell existing property, a tenant representation broker can also assist in this process as well. Find out more about what it costs to hire a broker to sell your property. What Next Step Should You Take? Now that you have a better understanding of what a tenant representation broker is, the next obvious question is what does it costs to hire one. Read our blog post How Much Does It Cost to Use a Tenant Representation Broker, to get the answer to that question. Our team of tenant reps have years of experience in the Austin market and would love to help you with your real estate needs. If you feel that hiring a tenant representation broker is right for you, schedule a consultation today.